The angelfishes from the family of Pomacanthidae are closely related to the butterflyfishes from the Chaetodontidae. As a matter of fact, they were even classified as one and the same family until 1978. The Pomacanthidae are very brightly colorful fishes. In essence, they are hermaphroditic and protogynous, meaning they turn male after female modus. Angelfishes are small to medium-sized, measuring 7 to 70 centimeters. Their bodies are very compressed and they have a small mouth. Angelfish are active during the day. They like to roam around rich coral reefs and rocky areas with enough caves, holes and crevices to find shelter. There’s a striking difference in colorisation between young and adult angelfishes. They are very territorial with males patrolling areas up to 1000 square metres. Here he watches over his harem counting 2 to 5 females. When angelfish feel threatened they produce low-frequency ‘knocking’ sounds. This can be heard by divers. Measuring up to 50 centimeters the arabian angelfish is found at 4 to 50 meters in depth. It prefers reef slopes and sandy bottoms, where it feeds on sponges, sea squirts and algae. The Arabian species has a deep blue compressed body and vertical yellow spots on both sides in its male modus. The emperor angelfish has a compressed body and small mouth. They are truly strikingly beautiful to look at. The flattened shape of an angelfish enables it to wind their way amongst the corals; it also enables them to retain their stability when manoeuvring at low speed to pick up items of food. The young angelfish looks totally different to the adult, having concentric white rings on a dark blue background. You will find the juveniles under ledges or in holes of shallow reef flats. Adults go deeper, from 3 – 70 metres. Adult males typically defend a large territory containing 2 females. However, you ususally see the fish in pairs. Emperor angelfishes in their adult stage like sponges and other invertebrates. When juvenile, they prefer lagoons and places with crevices. The royal angelfish frequents lagoon zones and lives on outer reef slopes to depths not exceeding 48 metres. Its maximum length is 25 centimers. It’s an archetypal angelfish with its compressed body and small and pointed mouth. The royalty under the angelfish is orange with light blue vertical bands which are bordered in black. Absolutely beautiful. The royal angelfish feels very comfortable in regions that are rich in corals, providing a menu of algae, spoges and sea squirts. It finds shelter here when feeling threatened. The young of this species have light vertical stripes on the sides. The adults feature a large yellow spot on the sides. The yellowbar angelfish rends to be solitary. It can grow to a lenght of 30 centimeters. swallowtail angelfish and masked angelfish. The male type has stripes, the females re plain with spottings. They swim in pairs or harems on outer reef slopes, often feeding on zoöplankton above the reef. 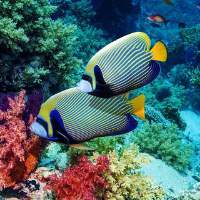 The zebra angelfish appears at depths between 15 and 70 meters and measures a maximum of 20 centimeters.